Whether you are arranging a party, a wedding, a corporate event such as a business award ceremony or a product launch, you will want an impressive venue that is large enough to cope with the amount of guests and a range of options to tailor make your event special. 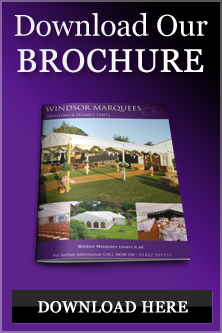 Look no further than Windsor Marquees! Offering the highest standards in marquee hire with a personal and professional service very step of the way from booking through to break down, trust Windsor Marquees. So how do I hire a marquee? Windsor Marquees can provide the whole package! If you want to book a marquee for your event simply call the team to discuss your requirements and find out how they can help you. They can provide for every size event from a small gathering up to a large business launch to 500 delegates. The experienced and professional team can take care of every detail from erection of the marquee to provision of accessories through to hosting at the event itself. Founded in 1996, if you want the best service for marquee hire in the areas of Gloucestershire, Worcestershire, Oxfordshire, Forest of Dean and Tewkesbury look no further than Windsor Marquees. Not only can they supply and construct your marquee of choice they can supply a range of window walls, entrance porches, carpets and solid flooring as well as tables and banqueting chairs with coloured seat pads and all with a smile!